Peter Burns before and after plastic surgery. How could anyone forget Peter Burns? The flamboyant "male" English singer and front man of the group Dead or Alive, who gave the world that sensationally catchy hit song "You Spin Me Round (Like a Record)"
The gifts just keep on giving with Mr Burns, as he showcases his huge giant lip implants, along with his Bram stoker porcelain face and giant cheek implants. 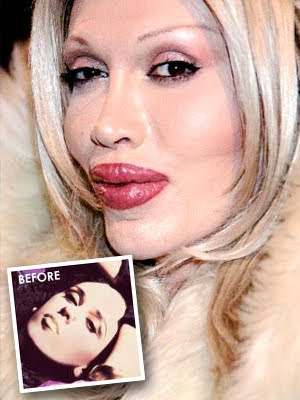 And you can clearly see in the before and after picture, he was already a beautiful woman before all the plastic surgery. Great! I just lost my lunch!